CRM buyers have a wealth of deployment options available to them, providing unprecedented flexibility, cost-efficiency, and business value. Choosing the right option involves carefully considering your needs. Not only must business end-users and IT managers analyze their business scenarios, they also must understand the strengths and limitations of the available solutions. While evaluating CRM solutions involves a number of criteria, this white paper focuses on the CRM infrastructure. 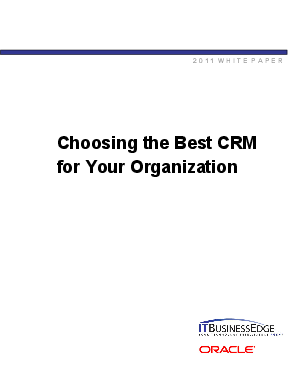 Specifically, this white paper describes and analyzes the five most popular deployment scenarios to help IT and business decision makers pick the best option for their business needs.